Devendra Fadnavis also visited Kirkasal village in Satara which he described as a model village with a young engineer as Sarpanch. Here too he observed how 'Shramdan' has become a part of daily lives of the villagers to ensure work is completed on time. Satara: Maharashtra Chief Minister Devendra Fadnavis offered 'Shramdan' or donated labour while inspecting the progress of Jalyukt Shivar in Satara district of Maharashtra today. 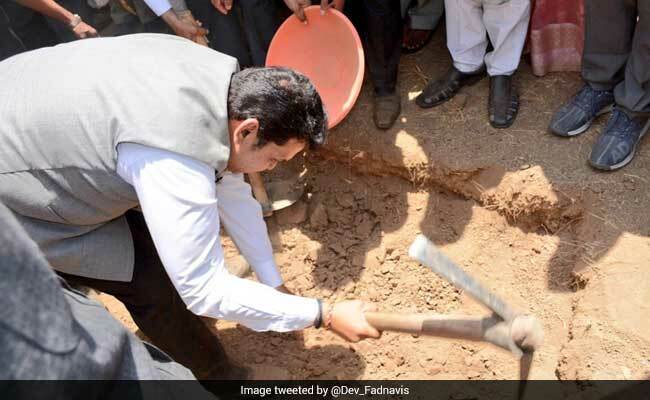 The Chief Minister along with officials was seen lifting stones and putting them at an under construction site as part of the Jalyukt Shivar programme. Symbolic as the move may be, it was intended to get more villagers to dedicate labour to ensure the work gets completed on time ahead of monsoon. "It was so inspiring to be with thousands of volunteers in Nhavi village, Koregaon taluka, Satara district for Shramdan ! @satyamevjayate (SIC)" he tweeted. The chief minister also visited Kirkasal village in Satara which he described as a model village with a young engineer as Sarpanch. Here too he observed how 'Shramdan' has become a part of daily lives of the villagers to ensure work is completed on time. The Opposition, however, alleged this was only a photo op and said the chief minister should look into allegation of inflated figures. "These were the people who were critical about Rahul Gandhi's Shramdan. Jalyukt Shivar needs a more administrative attention as people of Maharashtra has given the Chief Minister the responsibility to solve critical farmers' issues. Chief Minister should focus on this instead of photo ops," said Maharashtra Congress spokesperson Sachin Sawant.